Piekenierskloof is a high lying fruit farming valley on the West Coast, roughly between Citrusdal and Graafwater. Aside from fruit trees, the area is well known for an abundance of old dry farmed bushvines, particularly Grenache, Chenin and Palomino. In the far north-east corner of Piekenierskloof lies a gem. 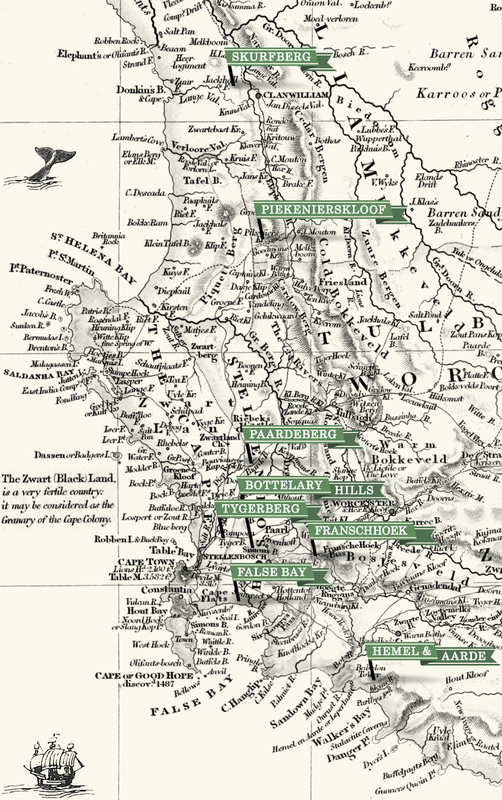 Isolated and elevated, beautiful and wild – the farm called Tierhoek. For the last couple of seasons, we’ve had the great privilege of buying two old parcels of Chenin from Tierhoek. They were planted in 1977, on red sand. In fact, the wine itself is reminiscent of Skurfberg in many ways – great acidity, vivid high-toned citrus, great purity. The vineyards are also a bit odd in that they’re trellised onto a half pergola, or skuinskap in Afrikaans. This is probably one of the factors that contributes to the late ripening (far from the warm soil). Other important factors are the proximity of a cliff face that causes the sun to rise very late in summer, and also the elevation of 760m above sea-level. Our friend Franco Lourens has bottled some as a single origin wine called Skuinskap Steen. It’s worth seeking out, if you can find it.